High-end, small-run business card printer, Moo.com, has been publishing some pretty cool stuff on its blog. 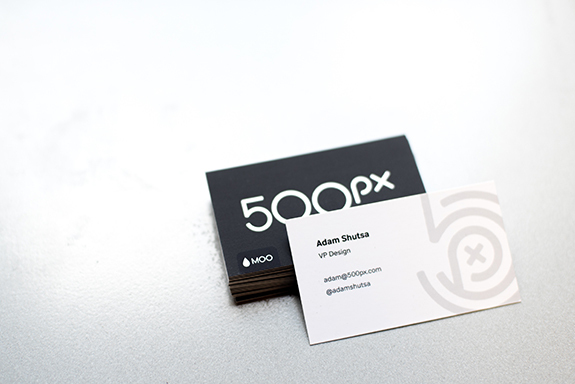 For example, this recent post about 500px’s brand refresh. I’ve written about brand refreshes in the past (When is it time for a brand refresh?) and have shown some of our examples (Announcing Our Newest Site Design & Build, Recent Work: GNO Refresh), but what makes the MOO article so rich is that it presents the specific challenges the brand was facing, then documents the process with photos and interviews—so you get a bit of a behind-the-scenes look. In this case, the creative concepting phase by the team lasted eight weeks and resulted in over 50 concepts. Here at Mix, we typically don’t have the luxury of such a lengthy timeline, but certainly this enables the group to fully explore and refine their ideas. The selected logo and abbreviated mark work in tandem to convey the 500px brand. Image courtesy of 500px via Moo.com. Design by Focus Lab. In the end, the client selected designs for a full-name logo and an abbreviated mark that could be used together to convey the brand. What do you think of the results?